This journal offers an international, transdisciplinary exploration of social, cultural, historical and material processes, dynamics and structures that make up human experience. 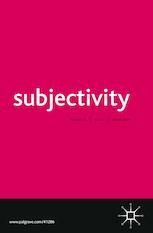 Subjectivity is designed to support and promote the importance of subjectivity as a leading criterion for analysis of psychological, historical, social, cultural and political trends. The journal encapsulates current discussion and debate, and promotes discourse on subjectivity that transcends disciplinary dividing lines and bridges the traditional dichotomies between disciplines. The aim is to influence the terms of debate in social sciences and the humanities from anthropology to geography, sociology, gender studies, post-colonial theory and more. The journal publishes original articles, critical reviews of books and films, editorials and more. Several times a year the journal offers special issues on topics of recent or compelling interest. The range of coverage is broad, touching on such topics as feminist struggles against death and violence; sense of self after traumatic brain injury; living with advanced cancer; immigration controls and au pairs and domestic worker visa holders in the UK and more.